Iowa farmers made good use of the dry weather last week and planted more than half of the state’s intended corn acreage for this year. The U.S.D.A. weekly crop update says that’s the largest percentage of Iowa’s corn acreage planted in a single week in more than 20-years. 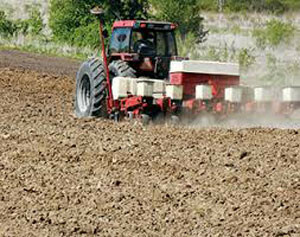 The planting progress does vary based on the region of the state. Iowa State University agronomist, Mark Johnson, covers central Iowa, which looks to have the most corn in the ground. “I would say that Story, Marshall, Polk and Jasper are virtually done. In fact, there’s a fair amount of corn up in those early four counties, and there’s even getting to be some beans poking through,” Johnson says. The report showed 68-percent of the corn crop is planted, which is 8 days ahead of last year. And 11-percent of the soybeans are planted, putting farmers 5 days ahead of last year. Planting for both crops is ahead of the 5-year average.